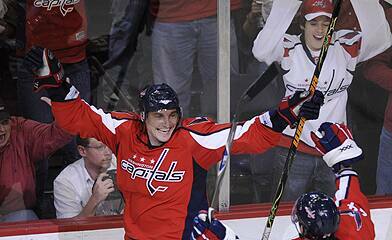 There is a mix of feelings toward the Capitals' moves on free agent Tuesday. At first there was a lot of animosity headed in the Caps' management way when GM George McPhee seemed to have botched the Cris Huet deal and went with a less capable goaltender in Jose Theodore >>>. Then that flipped when it had been revealed that Huet was actually given what they had asked for and still went to the open market. McPhee afraid he would be with out a number one goaltender at all, made the move he thought he had to to get a number one goaltender. Huet dismissed the offer that they themselves told McPhee they would sign for and headed for open market. When all was said and done, Huet got a better contract with Chicago. Which already has a "number one" in Nic Khabibulin. In a way it's funny that both Capitals' goaltenders, Cris Huet and Olie Kolzig, went to different teams that already have number ones (in Kolzig's case he is right back into a situation with 3 goaltenders in Tampa with Mike Smith and Karri Ramo). With Huet going the open market route, the next best thing was Theodore who was willing to sign on for less time and money. Think of it as a "patch" until the Caps young talent can get their feet wet. Although Theodore, while inconsistent, is no "patch." He is a good goaltender. Will he produce the numbers for the Caps that are comparable to Huet's? Maybe not, but he is no slouch either. When his game is on, Theodore is a playoff goaltender and has the ability to sway a game or two. If you want to draw side by side comparisons, Huet has never made the second round of the playoffs, Theo has (not to mention got cozy with Paris Hilton). If the Avalanche had a healthy squad in front of him, Theodore could have done a shade better too. The Capitals do have some talent in the pipeline in the goaltender department and are certian that their prospects are a year or two away from the big show. The Caps didn't want to be bogged down with a lengthy contract if the likes of Simeon Varlomov was ready to play in the big league after spending some time in the minors and making his way through the system. If Huet signed for four years and Varlomov has to sit on his keaster to wait out the contract. The job isn't done. Green check, a goaltender check. Now onto the RFA's with the likes of Eric Fehr, Boyd Gordon, Shaone Morrisonn and Brooks Laich need to be re-upped and UFA Sergei Fedorov. I still think the Fedorov deal will take the Caps almost up to training camp as he weighs his options. Obviously it helps that Alex Ovechkin is in constant contact with him and has been his number one campaigner. While those other contracts will take some time to iron out, development camp is around the corner. Just a week away, we will see the likes of goaltender Simeon Varlomov, defensemen Karl Alzner and Josh Godfrey, and forwards Oskar Osala, Francois Bouchard and Mathieu Perreault. Can a few of these players finally make the jump to the bigs? Its about time to find out. P.S. If you were curious, NHL network is replaying the 2008 playoff series with Minnesota and Colorado. Your chance to see Theodore in action over the next week or so. I'm going through a lot of mixed emotions of the Huet and Theo deals. oh and almost forgot, puck olie. seems that huet wanted more $$$, so have a great time against detroit over those next 4yrs. theo is on if he can get roughly more than 25 wins per season. however, since the season hasn't even started, this is all speculation.